Jesus made many prophecies to his disciples. One of those was that there would come a time when followers of Jesus would be put to death by people who would think they were doing God a favour. John 16.2-3 - "They will put you out of the synagogue; in fact, the time is coming when anyone who kills you will think they are offering a service to God. They will do such things because they have not known the Father or me." Around the world today, we can see extremist groups who kill people, thinking that they are serving God and doing him a good and holy service. At times, these terrorist groups do incredibly evil and sickening things in the name of their religion. One example was of a family in Syria who refused to convert to Islam so ISIS killed his son in front of him and then killed the father. They honestly believe that they are offering God a service and doing God's work. But as Christians we can see that this is really evil. But this is a challenge to us - Jesus told us to love our enemies and even do them good. This is very hard, especially if you've seen family or friends murdered. But time after time, Christians forgive their killers. A man called Micah in Nigeria saw his wife killed by Islamists. They attacked him with a machete and left him with serious wounds. His response was this, "I don't keep records of wrongs." This will look at an incredible lesson we can learn from the Bible - from one place - Syria. Credit for some of this must go to GOD TV 'In Depth' with Ann Buwalda (seen 19 Feb 2016). Then Ananias went to the house and entered it. Placing his hands on Saul, he said, ‘Brother Saul, the Lord – Jesus, who appeared to you on the road as you were coming here – has sent me so that you may see again and be filled with the Holy Spirit.’ Immediately, something like scales fell from Saul’s eyes, and he could see again. He got up and was baptised, and after taking some food, he regained his strength. When we look at the life of Saul (who became Paul the apostle), we see a man going around for religious and political reasons, seeking to kill and persecute those who disagreed with his version of religious ideas. In Acts 7, we read about the first Christian killed because of his faith - Stephen. Saul was present at his killing. Acts 8.1 - And Saul approved of their killing him (Stephen). Acts 8.3 - Saul began to destroy the church. Going from house to house, he dragged off both men and women and put them in prison. Across the world today we see many people being persecuted because they are Christians. Often we forget and don't understand what is going on. We ignore the killings in places like Nigeria, DR Congo, Uganda, India, Pakistan, Indonesia or even in Israel. And because the world is silent and does nothing, the problem gets worse and then we see terrorist crimes like those in France. Galatians 6.10 - Therefore, as we have opportunity, let us do good to all people, especially to those who belong to the family of believers. But God took someone who was fierce in his persecution of Christians and prided himself in doing it well - and God flipped him right side up (180 degrees round the other way) and made him even more effective for the good news about Jesus. Without Paul and the things he did, the good news about Jesus would never have spread like it did. So keep on looking for ways to help the refugees and even pray for those who hate Christians - God will turn many lives around from hate to good ! Let's take a look again at where this happened.... On the road to Damascus - which is in Syria. In 2015-2016, the numbers of refugees from Syria have meant that over 1 in 10 Syrians have left their country. Mostly, these people are victims. They're not 'freeloaders' wanting an easy life in another country. Their own country has been destroyed by extremists, governments who back them and by tribal and other groups all fighting each other - for influence, for political reasons, religious reasons and for land. People have been forced out of their homes by extremists and their evil ideas. Many of those caught in the crossfire of war and hatred have been Christians. Despite this, many Christians have stayed behind and done good to the people around them. God is also moving in the lives of terrorists - many of them are giving their lives to Jesus. One example is an ISIS fighter from Northern Syria who came to refugee camps to kill but met Jesus and his life was completely changed. So God saved the modern-day terrorist who wanted to kill, just as God saved Saul (who was killing Christians) and gave him freedom and the love of God. It's amazing to think of these two stories, separated by 2000 years but both showing how God is alive and working today! So keep looking for ways to help the refugees and make a difference - because you want to show God's love and because you know how good God is and ho much he loves the refugee. Time after time, it's the refugee, the orphan, the widow, the person on the fringes that God shows an extra special care for. So should we! Many times we read about places in the Middle East in the Bible. This isn't just about history, it's about things God will do in the future. Remember that Jesus is a Jew, born in Israel and will return as the King of David to Jerusalem. In many ways, Jerusalem and the events in the Middle East are like a compass to the rest of the world. What happens there often happens elsewhere - so the Bible can give us clues as to what things may happen in the future. So when we read about what's happening in Syria we need to look about what the Bible says in prophecy about the Middle East - this may even help us see where we are in history. For example, someone has calculated that there have been 16 major prophecies about Israel. 13 of these have been fulfilled exactly. Isaiah 19.23 - In that day there will be a highway from Egypt to Assyria. The Assyrians will go to Egypt and the Egyptians to Assyria. The Egyptians and Assyrians will worship together. If we think of the Middle East, we have 'Assyria' (which is Iran) on the 'right' (East). Then we go across a few countries and we have Egypt to the 'left' (West). 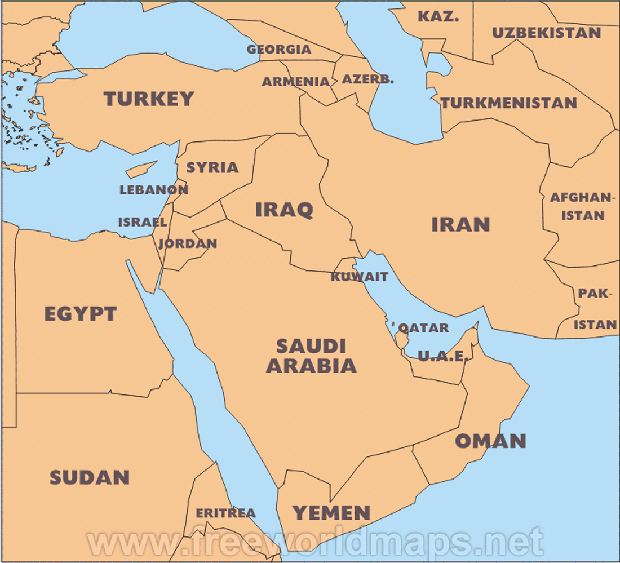 In between these two great nations we have Iraq, Jordan, Israel, part of Saudi Arabia and Syria. The Bible says there will be a highway across this whole area from Egypt to Assyria where people will travel to worship God. So Syria is still significant (as is Iran and Egypt) in God's plans. So never lose hope about Syria but pray and ask God to help! Except we're going to look at Saul the refugee. This powerful man who was killing and persecuting people and who had great influence - was touched by God and even temporarily blinded. God humbled Saul - brought him 'down to the ground with a bump' literally! His name was Ananias. Ananias from where? Damascus, the capital of Syria. Ananias heard the voice of God to go and meet with Saul. He must have been scared. Saul had killed Christians so maybe this could be a trap? Yet above his own fears he heard the voice of God and God called him to go to Saul. As a result of the obedience of Ananias, Paul was healed and could see again and he was set free spiritually with the Holy Spirit filling him! Here we see God's heart - to heal, restore, set free and help us become all we're meant to be. Saul became Paul and was the world's greatest apostle (apostle basically means someone who takes the good news about Jesus around the place and plants churches). Later on in Acts 9, we see how Barnabas also looked after Paul. Acts 9.27 - But Barnabas took him and brought him to the apostles. What do we learn? To be obedient to God and not to fear the refugee. There are lots of scare-stories about refugees but many of them are very talented people with great gifts. And we can have the privilege of being wise but respecting them and showing them God's great love. We should be like Ananias and Barnabas - and care for the refugee and respond to God's call towards the refugee. Now is a good time to ask if there is something you can do for the refugees. Can you raise money? Help someone in need practically. Take a missions type of trip? Can you pray for people working with refugees or refugees themselves? Are there ways you can show God's love to refugees? Ask God to put some ideas in your mind. Read the Bible. Then talk about your ideas, share them and see what God does through you. It could be very exciting and life-changing for you and many others!